Lollapalooza won't announce its official 2009 lineup for weeks, but online speculation as to who will play the fest, scheduled for August 7 to 9, is in full force. If the actual roster looks anything like what's being kicked around, it's bound to be an another amazing time. Considering what's being buzzed about across the Web and what simply makes sense, below are my picks of bands that have a good chance of popping up on the official lineup. Keep in mind that this is purely speculation, and none of these bands have been officially confirmed as playing the festival. 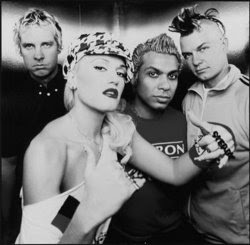 No Doubt - The newly reformed, Anaheim-bred pop/alternative/ska favorites recently announced plans of a summer tour that will kick off in May and find them "playing outdoor amphitheaters and arenas throughout the summer." Sounds like the perfect scenario for a Lolla slot, and given the fest's track record of booking 90s rock chart-toppers as headlining acts, it would make a lot of sense. Jane's Addiction - The band that headlined the original Lollapalooza is back playing together again, with a few smaller gigs already under their belts, a show scheduled at the Sasquatch Music Festival in late May and confirmation that they will support Nine Inch Nails on their farewell tour. It's only logical that the original Lolla headliners will do so again. Depeche Mode - The highly influential synth-pop act announced a worldwide tour to support their twelfth LP, "Sounds of the Universe," and a Chicago gig is missing from the announced dates, with a gap in the schedule that would coincide perfectly with Lolla. Put two and two together and a slot at the fest seems like a good possibility. Green Day - The band is releasing a new record, "21st Century Breakdown," in May, and considering their popularity with both the 90s crowd who got into them via "Dookie" and the youngsters who are better versed in "American Idiot," a Green Day slot would be huge. According to greenday.com news of a world tour to support the record is coming soon, and an appearance at the festival would definitely not be a shocker. Coldplay - There are two reasons they are prime candidates for Lolla this year. One, they are one of the world's biggest bands and have yet to play the fest. Two, there's no Chicago gig on their current tour schedule, and an opening on August 8 that would make an appearance possible. Blink 182 - Visit the pop-punkers' site and you'll find a message that reads, "To put it simply, we're back. We mean, really back. Picking up where we left off and then some. In the studio writing and recording a new album. Preparing to tour the world yet again. Friendships reformed. 17 years deep in our legacy. Summer 2009. Thanks and get ready..." As with No Doubt and Jane's Addiction, this reunion would lend itself perfectly to a set at Lolla. Kaiser Chiefs - The Chiefs are a pretty sure bet, considering they recently mentioned a Lolla gig in their recent fan newsletter. The Raveonettes - Sune Rose Wagner of the Danish duo also mentioned a Lolla gig, according to this blog. If this post was actually up on the band's MySpace site, though, it has since disappeared. Who are you hoping shows up in the official lineup for Lolla '09? Neko Case is on tour this spring, and her website states more summer dates to be announced soon. Those are all terrible bands. God help the entire world if even one of those bands make the line-up. I hope that the lolla people are not dumb enough to get green day, that would be horrible.... i would no longer buy a ticket to lolla because i would not want to support green day's terrible pop music. Green Day may be too big of an arena headlining band and if talk is that Tool will be there, I can't see that although I hope because I've been a fan for 12 years....I'd like to see M.I.A...and the yeah yeah yeahs..
and for the idiot's up above, Green Day is not a pop band...For any artist to achieve the amount of success from one album and all those who can appreciate it, are the true fans and understand what GD music is about....If you think of Green day as a pop band than you must too idiotic to understand music in general. Green Day IS a pop band, a bad one at that. Just because the music snob in you wont let you admit that you like a pop band doesn't change the fact that they write ten cent jingly jangly songs with verse-catchy chorus, verse-catchy chorus, a bridge, verse-catchy chorus. Lather, Rinse, Repeat. Thats pop music my friend.